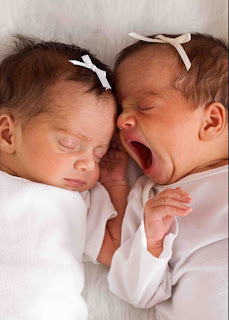 We had some pictures taken of the twins and it was so hard to decide which ones to use for the announcements. Almost everything turned out great. My friend Adrian made the announcement for me. Again this was hard to choose because she made 4 or 5 for me to choose from and they all looked great. We sent the announcements out this weekend and I decided to post it because we just weren't able to send out as many as we had planned. Just sending them to our families was making us broke. So if you didn't get one, please accept this post as our apology. Amy, the girls are beautiful. Thanks for posting the pics. Love them. Beautiful!!! These are fantastic- but it is not hard when you have darling twin girls!!! oh my goodness! Those pictures are adorable! 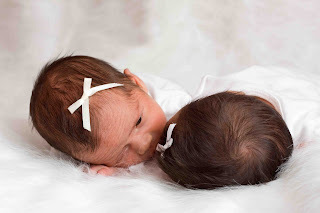 These little ones are stunning, really beautiful to see they are healthy too. Amy, Syd & Bre are such beautiful girls!!! Thanks again for letting me make the announcement!! I had so much fun putting it together for you!! OH MY HECK! So so SOOO cute! gorgeous! i love all of them, i know why you had such a hard time choosing. but the announcement turned out so well. i know what you mean about sending stuff out like that. printing is not so expensive but the postage and stuff. oh man! adds up so fast! SOOO sweet! love the pics, thanks for sharing!!! I don't know why but the yawning picture is my favorite. it makes me giggle everytime i see it. So darling! 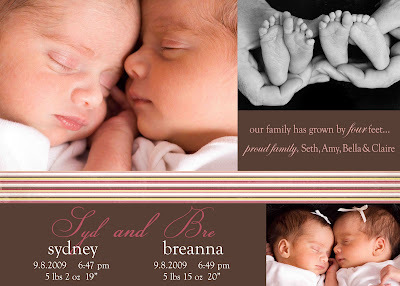 Baby announcements for multiples are twice as cute! Love all that hair!